Greetings again from the darkness. The film is based on the book written by Mary Mapes, “Truth and Duty: The Press, the President, and the Privilege of Power”, and plays like a desperate attempt at rationalizing the actions of a TV producer, a TV news icon, their team of reporters and researchers, and the endless drive for ratings by a network news organization. Telling only your side of the story when a significant conflict is involved, does not encourage thinking people to take up your cause. In 2004, Mary Mapes brought in her team to dig into the rumors that President George W Bush had received preferential treatment in military assignments and that his military service records were either incomplete, had been altered, or proved that he did not fulfill his service requirements. Ms. Mapes professional relationship with Dan Rather allowed her to bring him into the fold, and resulted in significant air time on CBS and “60 Minutes”. Most of us know how this saga ended … Mapes and her team were let go, and Mr. Rather’s time as the network news anchor was unceremoniously ended. While there may very well be substance to the story they were chasing, both the book and the movie act as Ms. Mapes defensive pleas of innocence. 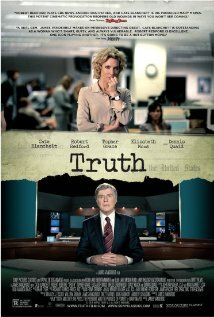 In the film, Cate Blanchett plays Mary Mapes, and Robert Redford plays Dan Rather. Ms. Blanchett, as usual, is exceptional; and Redford is solid in capturing the essence of Rather (though the hair color variances are distracting). The other key players are: Topher Grace as reporter Mike Smith, Dennis Quaid as researcher and former Marine Lt. Colonel Roger Charles, Elisabeth Moss as Lucy Scott, Bruce Greenwood as Andrew Heyward (President of CBS News), Stacy Keach as Mapes source Lt. Colonel Bill Burkett, and Dermot Mulroney as CBS attorney Lawrence Lampher. The film is well cast, but it’s not enough to make up for the weak script and the less-than-stellar direction from first timer James Vanderbilt (who did write the screenplay for Zodiac, and is the great-grandson of Albert G Vanderbilt). Rather than provide any proof that the story was properly documented and confirmed, Mapes and Rather decry the loss of reporters who ask the “tough” questions. Their defense seems to be that they were brave enough to chase the story and ask questions. A sequence is included that positions these two as the last bastions for true news reporting, and that these days news organizations are more concerned with profits and ratings, than breaking a story. This argument conveniently omits the fact that information flows much more freely today than in “the good old days”. The actions of politicians and industry leaders are constantly being questioned and scrutinized by the endless stream of bloggers and reporters – both amateurs and professionals. There is no shortage of questions being asked, and the ease with which accusations are leveled actually fits right in with the Mapes approach. The frustrating part of the movie is that it’s a missed opportunity to detail how “legitimate” news organizations go to extremes to document and verify their information and sources, and this is where Ms. Mapes’ team fell short. Without intending to, the film plays more similar to Shattered Glass (2003) than All the President’s Men (1976) … getting a story being more important than proving a story. We are left with the feeling that Ms. Mapes believes asking a question is more important than proving the facts. The cringe-inducing shot of Dan Rather’s final broadcast leaves the viewers with the impression that the objective of the film was to place Mapes and Rather on a pedestal of righteousness. The only thing actually confirmed here is that heads rolling at CBS was the right (and only reasonable) call. This entry was posted on Thursday, October 29th, 2015 at 11:39 pm and is filed under Drama. You can follow any responses to this entry through the RSS 2.0 feed. You can leave a response, or trackback from your own site.